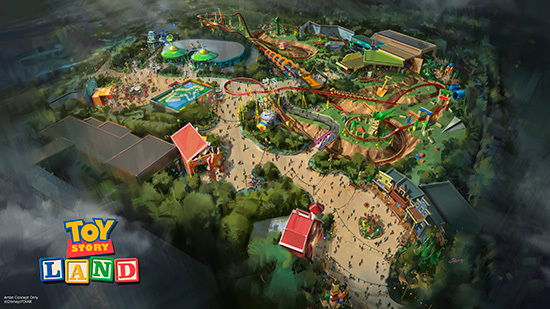 Toy Story Land expansion announced for Disney's Hollywood Studios. Family coaster part of the plans. So much love for DHS today! i love the theming of midway mania so this will be fun to walk through! 2 brand new attractions for this too! A bummer that its just Toy Story though, especially with all the upcoming Pixar stuff and the possibilities with Monsters. inc, Cars, Incredibles etc. with another track for midway mania! thank god! At least we got Star Wars. Please tell me that the Imagineer on stage didn't say Toy Story Playland is on the same level as Cars Land? No...She said the new Toy Story Land will be on the same level. The Slinky Coaster looks pretty good for a family coaster Not like Slinky Dog Spin over in Paris. They showed an animated model during the presentation. Thank God its not off the shelf looking like Hong Kong and Shanghai. I want real dark rides but this isn't the worst thing in the world. What theme does the cup spinner have? Buzz? Also what land does this replace? Same level of theming she said.